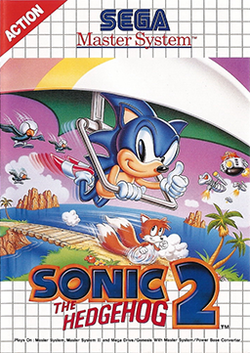 Sonic the Hedgehog 2 is the second game in the Sonic the Hedgehog series released for the Sega Master System and Game Gear. It was released first for the Master System on October 16, 1992 in Europe and Brazil, but this version never saw a release in North America and Japan until it was released for the Wii Virtual Console in 2008. The Game Gear version was released in all regions in October and November 1992. It follows a different storyline to the Mega Drive version. Having been released before the Mega Drive version, this game marks the debut of Miles 'Tails' Prower. Having defeated Dr. Robotnik, Sonic returned to his island home. But, he quickly became bored here, and left again in search of adventure. After some time away, he returned to find that all of his friends were missing. The only clue Sonic can find on the island as to their whereabouts is a letter left by one of his friends, Miles 'Tails' Prower. In the letter, he writes that he and the other animals have been kidnapped by Dr. Robotnik. Tails is being held by Robotnik in a location known as the 'Crystal Egg Zone', and to ensure his safety, Sonic must find the six Chaos Emeralds, which will allow him to enter the Crystal Egg Zone. This page was last edited on 13 April 2015, at 17:34.